Well I guess this project of System 6 will hinge on two others that MIGHT have it. The problem with the greyscreen lockup is that it occurs before Macsbug is invoked, meaning you can't really look into what's going on. I will probably see about fiddling with it this weekend. I don't know what I can really do other than just try stuff. I suppose I can try installing onto a floppy, running a checksum operation on the System file to see if anything changed there, ... dougg3 looked at the Installer Script and according to him, it looks like it's mostly hand-assembled blocks of resources. I was *hoping* that there would be some kind of Installer "disassembler" that could take that and chop it up into a series of steps it does that are human-readable. Perhaps I can try opening the script with Installer 4.8 something like that. Is there a good HowTo page available (not one of the idiotic, newfangled video imitations of a well done web page) for archiving floppies for posterity and bullet-proofing them for attachment/upload integrity? Revised & updated version to follow in a while. You can use Disk Copy 6.3.3, but it doesn't regard 400K MFS and 800K tags properly. EDIT: If you want to do it in batch mode, ShrinkWrap 2.1 can do it. The only problem I've seen with ShrinkWrap is that it often doesn't write the data checksum properly (it just writes $0000000) but if you use "Convert Image..." then it will recalculate it. Pretty hefty bug right there. EDIT 2: I seem to recall some other program that also had a batch mode. It might be DART 1.5.3, or DC 6.3.3. Problem with DC 6.3.3 is that it can't image a disk directly to DC 4.2 format: rather, it images it in NDIF format and it's up to you to convert it afterwards. I have a strong adversion to DART disk images. DC 4.2 works with *everything* from Mac Plus upwards, any regular usual *NIX distro that can use USB FDDs and $ dd properly, works with emulators, Mac OS 9, everything except Windows. Wonders why this thread is 4 pages long about what? Because when everything is said and done, more is said than is done. Update: It works. Found out what the problem was. I suppose I should have caught it later. But as Matt Burch (Ambrosia SW) says, if it's not on fire, it's a software problem. I also have the figures for the IIci without the Rocket in operation. Remember this is with a RAM Disk <-> RAM Disk copy. HDD transfer rate will be slower. Also I'm running on VampireVideo with non-interleaved RAM. All with AFP file sharing, FTP and WWW TCP services will be quite a bit slower (the most I've seen was 66KiB/sec downloading through iCab). New record there for transfer rate. Do you have "Chasing Rainbows: Accelerated VideoCards", May '92 of MacUser? I was curious about video acceleration and how important it really was. (All this is from here that I'm looking at) Do you know anything about 040 accelerators for the IIsi, or the Tokamac ci, Impulse Performance/040? Seems odd that the Daystar Turbo 040 is not on that list, maybe it came out later. Probably did because the 33 & 40MHz CPUs were not quite out yet. If it had a prism splitting light as the lead graphic, I think I do. I've seen the scan dump pile a couple of times during the downsizing, but hell if I could find it right now! I've only ever compared accelerators to the Rocket33 I used IRL. A used 2300c was my next workstation and I bought a refurb 6360 with the intention of Sonnetizing it, just as I'd bought the IIx specifically for Rocketizing several years before. So un-cooking the stilted benchmarking/ performance graphs in those articles would be my only familiarity with other NuBus Architecture Accelerators. I have archived all of my Rocket driver disks (Both RocketWare and RocketShare) and sent the archive to Mk.558 for testing before I release it publicly on the Mac Garden. Nice. Rockets make interesting experiments possible. I'll check things up over the weekend. Yeah, that's the problem I have with the Rocket in the IIsi, the vampire video is so awful I can't go full screen. The selection is grayed out anyway. I need to get the RCPII/IIsi hacked in underneath the MoBo so I can ignore onboard video and go full screen or at least have a decent 640x480 Rocket Window inside 16" Rez. I'm hoping the Radius Rocket will play nicely with the Radius Pivot Card. It should I think, after all, the VidCard is more recent than the Rocket. I see you've got your SCSI2 daughtercard up and running. Does a standard RocketShare install disk set include drivers for the daughtercard? Have you tried striping RAID yet? If you use a RAM disk, the Rocket becomes blazing fast when freed from the bottleneck of sharing the systems main HDD. I took some pic's of the Radius nubus cards I am using in the IIfx, using the KMZ Zenit MIR-10A 28mm f3.5 Macro. Its been a long time since I last took any photos using a manual lens. The best graphics card for the IIfx would probably be the Apple 8 24GC, but its so oddball and picky it would probably be more headache than the speed boost is worth. Still, its the graphics card designed for the IIfx...so one day I will need to get one. The "Apple 24AC" does OK - it supports high colors, and its decently snappy. I have to wonder if there is any major difference between the Apple ROM version and the Radius ROM version, and their requisite drivers. I'm going to test out your software on my 33MHz model soon. So there isn't any software for the SCSI Booster? I'm trying to think how that would work with RocketWare since I've never seen that as an option. I've *heard* that there is a disk for it though. My Rocket manual says nothing about that. I will convert the Disk Copy 6.3.3 image in to DC 4.2. Still undecided if I should have them as separate individual downloads or just one package. EDIT 2: jt, if there is some version that you have that you'd like to add, let me know -- but I have to get back to work on the Guide so I won't have too much time. RW 1.3.2 is the golden egg here. Haven't supplied any screenshots yet but I have no problem cooking up a RocketWare image in System 6 if necessary. Snooper is a diagnostic testing program. First time I've seen it in color. The last time I used it, it was for a SE motherboard with some kind of fancy smanchy 68000 @ 16MHz board. I think I listed my software revs earlier in the thread. No time to look, gotta get to work. @IIfx: ISTR the Radius ROM enabling a better selection of 60Hz VGA resolutions. Dunno, it's been a long time. If you want to test the ROM, there's one listed on eBay ATM that's socketed in a "Parts Card" for $12.12 shipped. I have to get some of those EEPROMs for testing/learning to use the burner sent to me. I need to read the PCI->NuBus Expanse ROM for archival purposes. The Duo MiniDock ROM transfered to the DuoDock ROM package and duping Radius ROM replacements for my Apple cards are the test exercises I'm going to do before putting the irreplaceable Expanse ROM in harm's way. No time for anything like that until I clear the joint out and find a new roommate though. Mk.558: That wouldn't be the thing you sold me a few years back, would it? It *was* you, right? Regardless, it's safe and sound in its MacBag. Which reminds me, I should go about getting it from storage and running it awhile to see if it, well, runs. Probably. I know sold you two brand-new unused 800KiB drives. I also know I sold off Snooper, but not before I made a disk image of it. EDIT: Also I found out that getting info on the Rocket in the Rocket CDEV inside SSW6 also tells me it's a 25MHz Rocket. Huh. Legacy compatibility? I do know the 25MHz Rocket came out first. OK, that's good. I haven't used it much, but I have it, and it worked last time I tried it. I definitely remember you selling me the drives. In fact, shortly thereafter I used one of those drives to rejuvenate one of my SEs, and much more recently, the other as a tester (I think I have it in a Plus presently, but I haven't got the proper cable for it). They're VERY useful! So a Mac needn't be equipped with a Rocket-thingy for this Snooper to work, correct? I should find it. It looks useful. Nah. But it runs under System 6 and is less than 1000KiB, so that makes it somewhat useful. jt: Looking at your post on page 2, IIfx had RW 1.3.2, which he generously imaged and it works great. The other version of RW you have is the same one I have, RW 1.5. 1+1 = 2 I'm slightly interested in those Rocket Docs but I don't have a scanner, but I could probably get access to one at a library. I went on an article-searching mission and dug up this, no images ... Hopefully some has this article somewhere on the real deal. Good because video acceleration was something I never got a proper article on. True-color (24-bit) video is slow on the draw. To speed it up, you need an accelerated-video card. But if you're looking for an enormous savings in the time you spend waiting for your computer to finish an entire task, you may be disappointed. If you're just looking for something to speed up your screen's response time to reduce your frustration at having to wait for it to be updated, an accelerated-video card may be just the ticket. The fastest card we tested was more than six times as fast as an unaccelerated-video card in 24-bit mode when scrolling through a Word document and was five times as fast with Photoshop. However, an unaccelerated-video card in 8-bit made proved to be almost as fast as the accelerated-24-bit-color cards in most tests. If cost is an issue and 24-bit color isn't, save yourself a big chunk of dough and stick with an 8-bit system. For those who want the best-performing accelerated-video card and don't mind paying for it, the SuperMac Thunder/24 ($3,499 list, $3,149 street) proved itself far and away the leader -- sometimes more than twice as fast as the accelerators from the other companies. It's also upgradable to SuperMac's ThunderBolt, which will be released soon; ThunderBolt promises to open up a whole new world of acceleration for publishing, graphics, and digital-video professionals. If price is a major issue, your best choice is the Radius PrecisionColor 24X ($1,999 list, $1,668 street). It missed being least expensive by a mere $4, and it consistently delivered performance as good as or better than that of the other non-SuperMac products. Although it's not a particularly good match for PageMaker, it accelerated incremental scrolling of other programs by a factor of 2 to 3. CPU acceleration made a noticeable difference to display speed in many of our tests, particularly for generating and redrawing images. For those who create and view rather than scroll around, a CPU accelerator may improve the Mac's on-screen performance more dramatically than a dedicated video accelerator does. If, however, you want the best possible display speed and cost is no object, take advantage of both strategies. Add both a CPU accelerator and a graphics accelerator to your Mac. You'll make yourself (and probably two manufacturers) happy. Waiting has turned into an art form: Think of the frustration of the concertgoer still standing in line when the music begins or of the Macintosh user watching as line after line of a true-color image is slowly drawn on the screen. The concertgoer, with the help of a scalper, can shortcut the ticket line -- for a price. The Macintosh user, with the help of an accelerated-video card, can put more zip into true-color image displays -- also for a price. But with accelerated-video cards costing as much as $4,000, the speedup had better be substantial. Is it? Or can some other technology provide more cost-effective Mac-celeration? MacUser Labs set out to answer these questions by testing eight accelerated-video cards that plub in to a NuBus slot in your Mac -- the CalCamp Chroma Vision QuickPlus, E-Machines Futura MX, Radius PrecisionColor 24X, RasterOps 24XLi, RasterOps 24XLTV, SuperMac Spectrum/24 PDQ Plus, SuperMac Spectrum/24 Series III, and SuperMac Thunder/24. We ran each through a series of tests based on everyday operations and then ran through the tests again, using a CPU accelerator instead of the video accelerators, to see if overall CPU acceleration was a better solution. As a control, we also performed the same tests with a Generation Systems Designer 24 unaccelerated-video card in both 8- and 24-bit modes. Our findings were surprising. Certainly, accelerated-video cards speed up your display's response time, but the degree of acceleration depends on the type of work you do. A CPU accelerator speeds up your entire Mac: Applications run faster and input and output requests are handled more quickly, for example. An accelerated-video card, on the other hand, is designed specifically to speed up the display on your monitor. For example, with a CPU accelerator, you'll notice a speed improvement when you apply a Photoshop filter to an image, but for faster screen updating when you place that finished Photoshop image into your PageMaker document, you'll probably want an accelerated-video card. On a monochrome screen, image updates appear almost instantaneously. When you put some color into the picture, however, things start slowing down. Eigh-bit-color images take noticeably longer to move around the screen, and with 24-bit-color, there's enough of a lag between the time you move an image and the time it ultimately drops anchor to frustrate most users. The reason is simple. The Mac has to process only 1 bit of data per pixel for a monochrome image but must process 32 bits per pixel for 24-bit-color images. (Although their purpose is a yet undefined by Apple, the extra 8 bits -- the alpha channel -- are used by many applications for special effects.) As you move up from a 13-inch monitor to a 19-inch one (more suitable for color applications and desktop publishing), the amount of data your Mac must process to put a color image on-screen more than doubles, to more than 3 megabytes' worth per screen. As all this image data moves through your Mac, it faces two bottlenecks: your Mac's CPU, which must build the pile of pixels to put onto the screen, and the throughput of NuBus, over which image data must travel between the Mac's CPU and the video card. If you've ever watched a full-color graphic image slowly ratchet its way down a screen, you know how frustrating working in 24-bit mode can be. Accelerated-video cards get around both bottlenecks. Such a card has a separate on-board microprocessor as well as RAM for storing video data. As you're working on an image, the microprocessor intercepts and processes calls made by your application to QuickDraw, which manages the drawing of all on-screen text and graphics on your Mac. The Mac's CPU is free to continue with the application as soon as the QuickDraw command has been issued, rather than doing the work itself. And because the video data is stored in RAM on the accelerator card, only the QuickDraw commands pass across NuBus, further reducing the amount of data passing through this choke point. Vendors can choose from various alternatives to use as the accelerator card's on-board microprocessor. CalComp opted for an off-the-shelf Texas Instruments 320C30 digital-signal processor (DSP) as the video processor on its accelerator. Other manufacturers have gone a step further and have crafted their own chips, called ASIC's (application-specific integrated circuits). These chips, which are optimized for carrying out QuickDraw instructions, can execute some video commands 100 times as fast as your Mac's CPU can. Although speeding up your Mac's CPU can also accelerate QuickDraw performance, the reverse is not true -- accelerating QuickDraw does not result in faster CPU performnace. Consequently, CPU-intensive tasks such as the use of Photoshop filters or Illustrator previews benefit greatly from a CPU accelerator but gain little from an accelerated-video card. The less data that must travel over NuBus, the better. As already mentioned, a way of limiting this is to store all necessary video data on the card that contains the video processor, thus eliminating the need for video data required by the card's processor to pass across NuBus. In addition, some accelerated-video cards include slots for GWorld memory. GWorld memory stors just the off-screen video data, resulting in an improvement in scrolling speed. The RasterOps 24XLi and the SuperMac Thunder/24 both have sockets that accommodate GWorld memory. RasterOps also allows on-board memory that's otherwise assigned to GWorld memory to serve as a RAM disk. Putting GWorld memory onto an accelerator card removes the NuBus bottleneck by placing the accelerator's microprocessor chip and the memory in which it stores its image data on the same card. Unfortunately, few applications currently take advantage of GWorld memory. The speedup potential of video acceleration is immense, once you consider the advantages of ASIC-based QuickDraw acceleration and efficient use of NuBus. But for all the cost of accelerated-video cards, the return can be small. In fact, many applications don't benefit at all. For a program to take advantage of video acceleration, it must use QuickDraw. Not all programs do. Similarly, for an application to take advantage of GWorld memory, it must be written specifically to do so. Currently, most are not. The processing required for other operations -- ordinary program overhead -- is still handled by your Mac's CPU and takes just as much time as before. To get our bearings on which applications benefit from accelerated-video cards, what form of acceleration is most effective, and exactly how much benefit you can expect from investing in specific products, we set up a series of structured tests based on real-world applications, including Photoshop, Word, Canvas, and PageMaker. We ran all the tests on the same system, a Mac IIci, connected to the same monitor, to eliminate any hardware influence on the test results. Additionally, we set all the accelerated-video cards -- except the CalComp Chroma Vision QuickPlus, which operates only at 1,152 x 870 pixels -- to a 1,024-x-768-pixel resolution. For our control, we chose the Generation Systems Designer 24 as a representative unaccelerated-8/24-bit-color card. We also tried a Fusion Data Systems TokaMac ci to discover what could be gained from a CPU accelerator. The TokaMac ci uses a 68040 processor operating at 25 megahertz to boost CPU performance. Publishing professionals who manipulate text and graphics all day long will appreciate the snappiness provided by an accelerated-video card. We discovered this by scrolling through and using the Zoom function on a Photoshop image. At a 50-percent scale, we scrolled through the entire length of the image incrementally by clicking on the down arrow in the vertical scroll bar and holding down the mouse button, a 45-second chore without acceleration. Then we scrolled through the image from beginning to end in one 4-second jump by dragging the scroll box to the bottom of the vertical scroll bar. The accelerated-video cards improved the rate of incremental scrolling more than the unaccelerated-video card and the CPU accelerator did. The best was the SuperMac Thunder/24, which was five times as fast as the unaccelerated-video card in 24-bit mode, followed closely by the SuperMac Spectrum/24 PDQ Plus, which was four times as fast. The other accelerated-video cards were two to three times as fast. The speed improvement in scrolling the full length of the image in one jump was more modest -- at best about 27 percent, again with the SuperMac Thunder/24. The TokaMac ci provided no improvement in the one-step scroll and was actually 40 percent slower in the incremental-scroll test. Like most drawing programs such as FreeHand, Illustrator, and MacDraw Pro, Canvas uses QuickDraw. 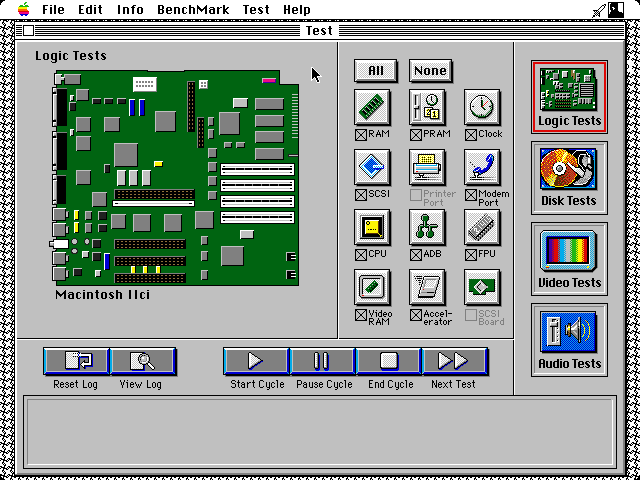 However, it still requires the main processor to compute changes to a document before QuickDraw updates the screen, so we weren't surprised to discover that the CPU accelerator was the winner in the Canvas redraw test. We selected all the elements in a complex test document and then shifted the entire collection left by 1 pixel, thereby causing the image to be redrawn. The redraw took 20 seconds without acceleration. The CPU accelerator increased the redraw speed by more than 50 percent. The accelerated-video cards did not help at all. We performed a zoom test on a PageMaker document composed of text and a color image, pulling back from a 400-percent view to a 100-percent one. After timing the first iteration of this operation, we zoomed back to 400 percent. Then we zoomed the screen back to 100 percent again in order to time the effect of any image buffering or other technique used by the various accelerators that would speed up subsequent redraws. 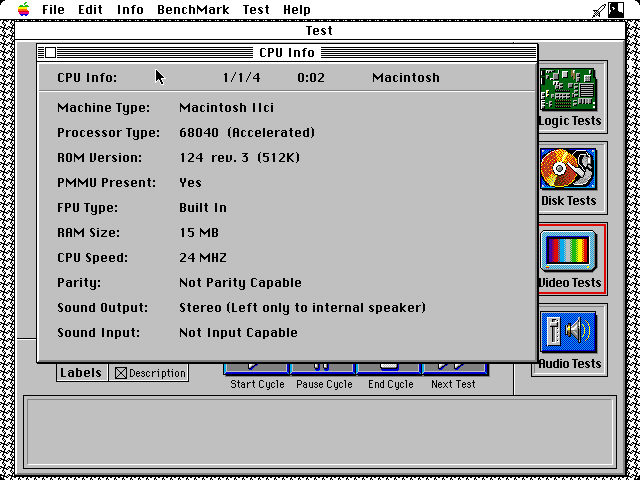 The initial zoom out was handled best by the TokaMac ci CPU accelerator, which redrew the screen nearly two and a half times as fast as the unaccelerated-video card did. The fastest accelerated-video card in this test, the Radius PrecisionColor 24X, almost doubled the zooming speed. On the other hand, the E-Machines Futura MX was slower than the Designer 24. On the second zoom, however, it pulled up to third place behind the SuperMac Thunder/24 and the Spectrum/24 PDQ Plus. The CPU accelerator produced about the same performance gain as in the first zoom, and the Radius and the RasterOps accelerated-video cards were actually slower in the second zoom test than they had been in the first. The CalComp Chroma Vision QuickPlus was unable to run these tests, because our test document was incompatible with its screen size. We evaluated the effect on-board GWorld RAM by running all the tests on the two products that offered it, both with the GWorld RAM switched on and with it switched off. No performance difference was discernible on any of the tests. The primary reason is that our tests -- and most current applications -- make little use of GWorld memory. 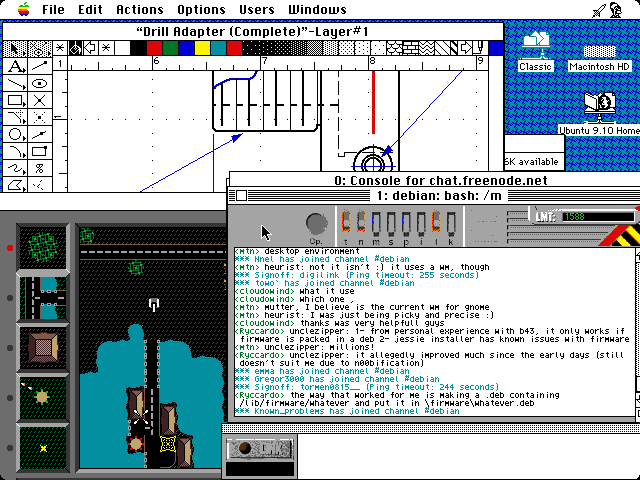 Although PageMaker 4.0 employs the QuickDraw GWorld commands and the System 7 Finder takes advantage of GWorld to manage memory when shifting among applications, any pronounced performance advantage to be gained from moving GWorld from system RAM to an accelerator card apparently lies in the future. Finding the right accelerator requires that you find the best fit among the specific products, the applications you want to speed up, and your budget. Besides matching a video accelerator with software that can best take advantage of its power, you also need to ensure that the card you choose will work with your monitor. If you want to be sure of a perfect match, you can buy any of these accelerators as part of a combination video-board-and-monitor system (for example, the CalComp Chroma Vision QuickPlus is available only with a matching monitor). Alternatively, you can shop separately for a compatible monitor (see Table 2). Most of the accelerated-video cards support several monitor resolutions and scan rates, or timings, meaning that you can buy an inexpensive auto-synchronous monitor to get started and later move up to a larger, more expensive display. Note that you need to match timings as well as resolution. Some cards make this easy. For example, during installation the SuperMac products cycle through their various resolutions and timings and you simply press a button when you see a clear image. The E-Machines Futura MX requires you to select timings with a special plastic tool, which is not shipped with the board! After reading this report, do you still want to buy a video accelerator? Accelerated-video cards are expensive, but they can overcome some of the waiting caused by your Macintosh's CPU as it processes raw video data and tries to squeeze this data through NuBus bottlenecks. Accelerated-video cards do make your screen snappier. But to get that Photoshop filter to go any faster, you still need a fast CPU or a CPU accelerator or one of a new class of accelerator products discussed in the "On the Horizon" sidebar. Making screen response snappier by installing an accelerated-vidoe card can reduce user frustration. But to really speed up your Macintosh's performance, other solutions are necessary. According to one developer, QuickDraw operations actually represent only about 5 percent of the total processing time in any session; you can get better response from your Macintosh by accelerating the other 95 percent of the system. Consequently, many manufacturers are focusing their attention on CPU acceleration. Radius, for example, is enhancing its Rocket CPU-coprocessor technology. The company's goal is to enable you to add multiple Rockets to your Mac, creating what it has named the Saturn V, after NASA's giant '60s-vintage spaceship. Each of the Rockets comprising the Saturn V will be able to run a program (or part of a process) independently, as if each Rocket were a separate Mac. You will, for example, be able to make a time-consuming manipulation in Photoshop more bearable by burying it in the background. Load the Photoshop job onto one Rocket, hide it under System 7, and then run another job on another Rocket while the first process continues. Because each job has its own Rocket, each will run at full speed. Although the video response may not be any quicker, you'll get more work done in a day. And as developers bring out distributed-processing schemes for such CPU-intensive chores as rendering, you'll be able to distribute parts of the same job to multiple Rocketts, thus speeding up the total job significantly. SuperMac is taking a different approach to acceleration. Rather than simply accelerating the entire Mac, it's targeting the full strength of a 40-MIPS (millions of instructions per second) RISC processor directly at applications most used by DTP and DTV (desktop video) professionals. In June 1992, it plans to release the SuperMac ThunderBolt, a NuBus card based on the SuperMac Thunder/24, reviewed in this report (Thunder/24 owners will be able to upgrade their accelerated-vidoe cards with a simple snap-in daughtercard). The SuperMac ThunderBolt will require application-specific software modules that off-load processes from the Mac's CPU and transfer them to a MIPS R3000 RISC processor -- SuperMac is claiming performance improvements as great as 1,000 percent. Two sets of such modules -- ThunderDTP and ThunderEffects -- will be bundled with the ThunderBolt at release, and more are expected soon. ThunderDTP will allow users of page-layout packages such as QuarkXPress and PageMaker to drastically reduce the time needed to pour and modify text and will also speed image and object repositioning. ThunderEffects will reroute the processing of Photoshop image-manipulation filters into the RISC processor, thus improving a common and time-consuming operation that's immune to the effects of video accelertors. The ThunderBolt comes complete with its own operating system, a debugger, and a development environment that SuperMac will be opening up to third-party developers later this year. Expect man of the top DTP and DTV vendors to develop their own modules as they try to keep demanding professionals happy during the wait for the Apple/IBM PowerPC. Pricing was not firm at press time, but if it's consistent with SuperMac's product line, expect the ThunderBolt with ThunderDTP and ThunderEffects to cost less than $5,000. RasterOps is following a similar strategy, with a 40-megahertz LSI 3000 RISC processor on a daughtercard to match its video cards. Although the chip is completely programmable, RasterOps envisions that it will first be used for JPEG (Joint PhotographicExperts Group) compression and decompression. It is fast enough to capture QuickTime movies with near-real-time frame rates -- 15 frames per second and higher at full-screen resolution. In addition to integrating higher-powered processors, RasterOps is working on another video-acceleration strategy, one that should prove a boon to people who use their Macs in publishing. The company has developed a propritary RAMDAC (random-access-memory digital-to-analog converter, the heart of video-card circuitry) -- to be available first on the company's ProColor 32 board -- that differs significantly from other RAMDACs by incorporating internal circuitry to do CMYK-to-RGB conversions in real time. This RAMDAC will let you manipulate images in CMYK mode, which directly corresponds to four-color-process printing. You'll still be able to preview your changes as you make them on an ordinary RGB display without having to stop and spend a minute or more to make a CMYK-to-RGB conversion. Spectral Innovations has adapted another technology that can be used for Mac image-processing acceleration. Its MacDSP3210 card, based on AT&T's 3210 digital-signal processor chip, can take over image-processing functions, much as a RISC chip can. The 3210 includes its own floating-point unit and excels at vector manipulations. Although the MacDSP3210 can already accelerate the performance of applications such as Photoshop by three to seven times for special-effects filtering and JPEG compression and decompression, its real powers lie in the future. Application vendors are adapting their products to take advantage of the MacDSP3210's 3-D-rendering power. The card will also be able to provide compression and decompression of video and audio under QuickTime. Lit price -- The manufacturer's suggested retail price. Street price -- The average actual price charged by a sample of dealers around the U.S. in November 1991. Maximum power draw -- The maximum amount of power the card requires, in watts. Supported bit depths -- The number of bits per pixel the card can support. Supported resolutions -- The number of pixels than can be displayed (horizontally x vertically). NTSC or PAL output -- Does the card let you output to analog monitors? NTSC is the U.S. analog standard, and PAL is the European analog standard. Bundled software -- The software that'shipped with the card. Hardware features -- Effects, such as panning and zooming, that the card offers. GWorld RAM -- The number of slots provided for attaching GWorld SIMMs and the maximum amount of RAM, in megabytes. Type/speed of SIMMs -- The type of RAM SIMMs the card can accommodate and their speed, in a nanoseconds. Block transfers -- Does the card support NuBus block-mode transfers? Resolution switching -- Does the card let your change resolutions without having to reboot? Adapter for Mac IIsi -- is an adapter card for the Mac IIsi shipped with the board? I have 5-6 of these cards left at $100 plus shipping. These were acquired from Radius and were originally intended to be replacements for Stage II cards that needed replacing. They are pristine and do not include any daughter cards. If you are interested in one or more, please contact me. I am interested in 2 rocket Stage 2. Is it working in a IIfx ? Ditto that, just found this post in an unrelated search. If still available, definitely want one!